Only a few more hours of school for 2014-2015. I've had a pretty good year with lots of challenges and accomplishments. 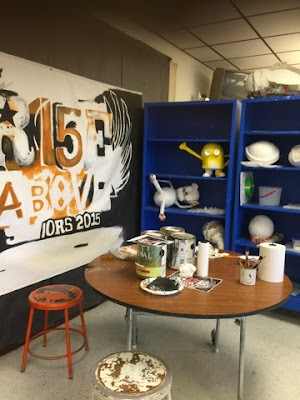 At the end of each school year my advanced students and I cleanup the art room and create some public art projects around the high school. One of the most popular projects is doing an acrylic painting of their choice (with my permission) on a tile from our ceiling. 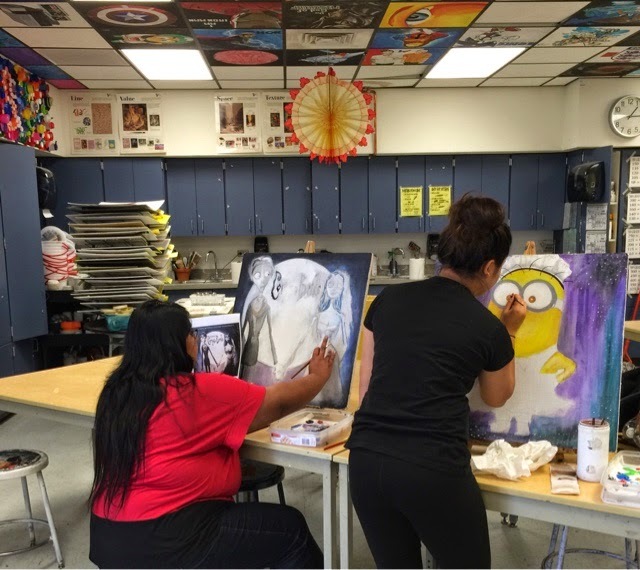 I permit my students to create whatever they like as long as I can live with it and it doesn't violate any school policies. For the rest of the year my students have to use noncopyrighted images in their artwork so they have to work from personal photographs and direct observation. 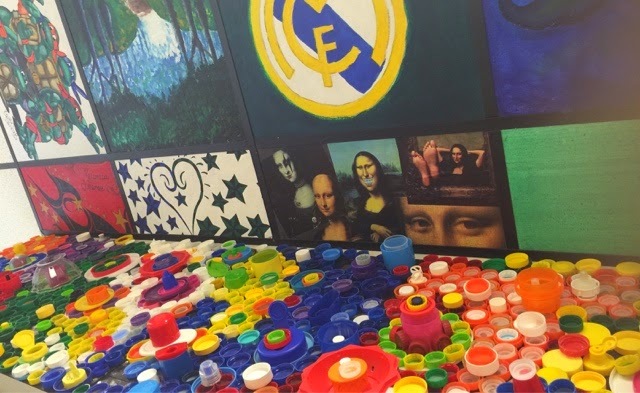 For this "for fun" project they are allowed to use copyrighted images since the tiles aren't being sold, entered in competitions or a part of their portfolios. 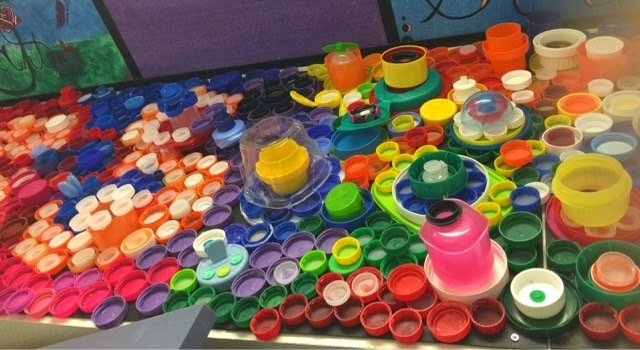 Our community has been saving plastic bottle caps for us and we've started a mural around the walls of my classroom. We hope to create an actual image soon but this project proved to be a lot of fun. 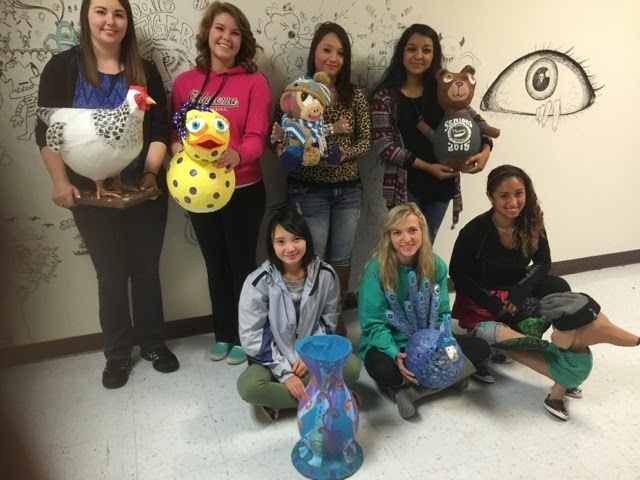 Here are some of my senior craft students with their finished paper mache' sculptures. This is another year-end project. Most of our seniors are finished and out of school for the last few days. These lovely ladies dropped by for a quick photo. My principal gave us permission to graffiti the walls on the hallway leading to my classroom. 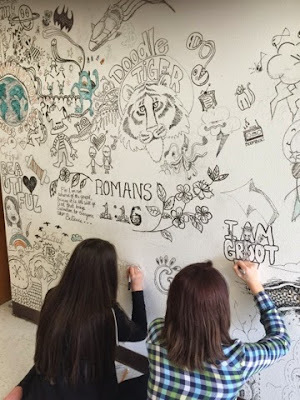 Again students have to show me what they plan to draw on the walls but they are then turned loose with Sharpies to draw what they want on a giant drawing. We've worked on and off of this project for the past few years. I love the different little doodles my students add. 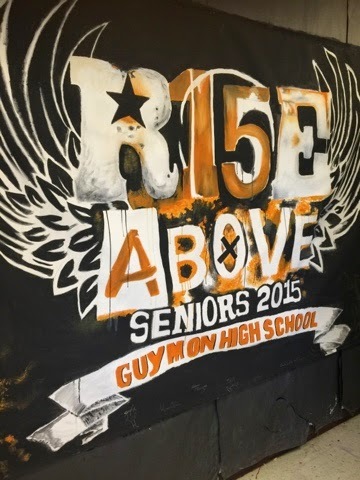 Finally, our seniors usually paint a backdrop for graduation. This backdrop is used on the stage behind the graduates and then students have photos taken in front of the painting. This particular design was purchased for their senior T-shirts this year and has been printed on our programs and announcements. So goodbye to the 2015 school year and on to a busy summer ahead. As a former teacher, it's wonderful and inspiring to see the work you've done with these kids. Very Nice Blog Post !! 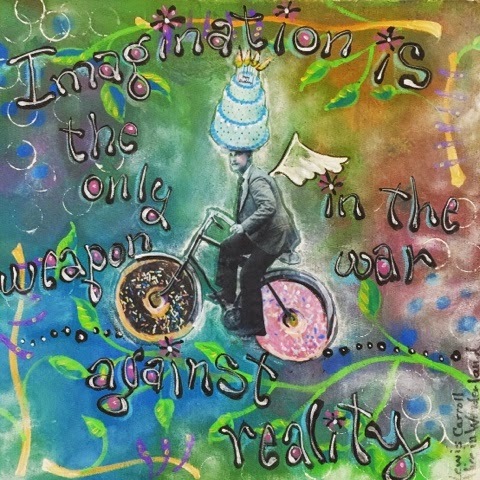 It has great combination of information and images wonderful and inspiring. Keep up sharing..